LOS ANGELES – June 2016 – With Aaron Shelby, grandson of the legendary Carroll Shelby on stage, Barrett-Jackson will auction the 50th anniversary Shelby GT-H (CSM160001C) concept and prototype car (Lot # 3003) for the Carroll Shelby Foundation at No Reserve during the inaugural Northeast Auction in Uncasville, Connecticut. At approximately 5:30 PM EST on June 24, The World’s Greatest Collector Car Auctions® will continue its tradition of raising money for charity by offering vehicles rarely available to the public. The Connecticut auction will feature a broad range of vintage, customs, supercars and late-model vehicles. On March 21, 2016, Shelby American unveiled a special run of performance-modified Ford Mustang GTs named the Shelby GT-H. The car celebrates the 50th anniversary of the Shelby GT350-H “Rent-A-Racer,” when Carroll Shelby approached Hertz about putting customers in the driver’s seat of this special edition car. 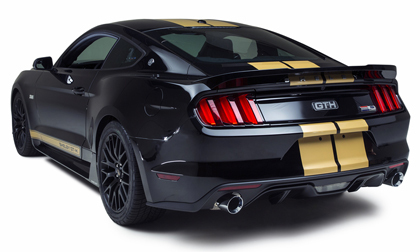 For the 2016 Ford Shelby GT-H, Hertz purchased the V8 powered Mustangs from Ford Motor Company and the cars were then shipped to Shelby American. There, Shelby added extra performance and style then sent them to Hertz, which gave the public access to a unique driving experience. The vehicle being auctioned has led a colorful existence. CSM160001C is both the concept and prototype car for the 2016 program. It is the vehicle in all promotional materials and photographs; visitors to the New York Auto Show were amazed to see it suspended on the Jacob K. Javits Convention Center wall. CSM160001C is scheduled to go over the block at No Reserve at about 5:30 PM EST, during the live TV broadcast by Velocity. The winning bidder will not only get an amazing contemporary collectible car, they will also contribute to the charity that Carroll Shelby founded. The inaugural Northeast Auction at Mohegan Sun, June 23-25, will be broadcast live on Velocity and Discovery Channel. For more information on becoming a bidder, follow the link to http://www.Barrett-Jackson.com/Bidder/Home. For auction information, visit the Barrett-Jackson website or Facebook. Established in 1971 and headquartered in Scottsdale, Arizona, Barrett-Jackson, The World’s Greatest Collector Car Auctions®, is the leader in collector car auctions and automotive lifestyle events. The company produces auctions in Scottsdale, Arizona; Palm Beach, Florida; at Mohegan Sun in Connecticut, and Las Vegas, Nevada. With broadcast partners, Velocity and Discovery Channel, Barrett-Jackson will feature live television coverage in 2016, including broadcasts in over 100 countries internationally. Barrett-Jackson also endorses a one-of-a-kind collector car insurance for collector vehicles and other valued belongings. For more information about Barrett-Jackson, visit http://www.barrett-jackson.com or call 480-421-6694. The Carroll Shelby Foundation was created by legendary racer and automotive manufacturer Carroll Shelby. Headquartered in Gardena, California, the Foundation is dedicated to providing medical assistance for those in need, including children, educational opportunities for young people through automotive and other training programs and benefitting the Shelby Automotive Museum. For more information, visit www.shelby.com.